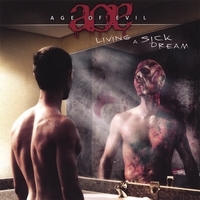 Age of Evil's debut album, Living A Sick Dream, finally offers something to be excited about in a world that bombards us with tedium on a daily basis. Phoenix, AZ has a solid reputation for producing highly talented thrash metal outfits (Flotsam & Jetsam and Sacred Reich being perhaps the most well-known) so it comes as no surprise that Age of Evil calls nearby Scottsdale home. This young outfit, formalized as a band only this year, consists of two sets of brothers - Jeremy and Jacob Goldberg on vocals/rhythm guitar & bass, and Garrett and Jordan Ziff on drums and lead guitar. Perhaps it's this familial bond that heightens their cohesion to a truly intense level. Whatever the secret, prepare to be blown away by Living A Sick Dream. The first round out of the chamber is "Call Me Evil", a blistering tune co-written by Tom Gattis (Tension, Wardog, Ballistic). No time is wasted introducing the extremely talented Jordan Ziff as he lights into whiplash leads and screeching solos. Each and every member of the band overflows with talent, but it's Jordan's mesmerizing fretwork that captures your attention right out of the gate. Jordan's brother Garrett is also featured prominently on the opening track, pounding out epic beats and crushing breakdowns. Musically Age of Evil exhibits strong early-period thrash elements the likes of which haven't been executed so flawlessly since the days of denim vests and studded wristbands. When not exploding into a searing lead or solo, Jordan teams with frontman Jeremy Goldberg for some truly jawdropping riffs. Besides the inherent appeal in the music, Jeremy's vocal style injects Age of Evil with a distinctly contemporary edge that allows Living A Sick Dream to bridge the metal generation gap. His voice is everything you'd expect from the early days of thrash/speed metal - sort of a Hetfield-Mustaine hybrid with a modern alt-metal edge to it. He has an iron-fisted grasp of the concept of vocal hooks and melodies, adding yet another dimension to the multi-layered success of the album. but also the distinctive noodling of Marty Friedman (Megadeth). As much as I admire Marty, I certainly mean him no disrespect when I say that his performance takes a back seat to the young prodigy. Marty's solos are a treat to hear, but it's Jordan who drives this song and this album through chamber after chamber of guitar wizardry. My favorite track on Living A Sick Dream is "The Storm". Here the band mellows out just a bit and brings a highly melodic, atmospheric piece of meat to the table. A little on the dark side (which is why I probably like it so much), the riffs are infectious and keep you riveted. While I was able to choose a favorite track, it wasn't because that particular song stood above any of the others - it was simply a matter of personal taste. The remaining 9 tracks are each outstanding in their own right, and contain slight variations which keep the album from ever becoming repetitive. Strings are used on "Fingertips of Fate", while female backing voclas are introduced on "Glimpse of Light". It's also on that track, as well as on "You Can't Change Me", where Age of Evil's early punk roots are most obvious. Around each bend is a surprise, but all are pleasant and only increase the enjoyability of this disc. The production on Living A Sick Dream is pristine, except that I would have preferred hearing a bit more of Jacob's rumbling bass. He's at the forefront on "Eye For An Eye", and just under the surface elsewhere, but I think he's also a major contributor to the band's tight sound and should be heard just a bit more. That very minor criticism is all I could come up with after listening to this album repeatedly for the last 2 weeks. It never gets stale, I'm always finding little enjoyable nuances that I'd missed on previous listens, and that is why I don't hesitate to bestow a five-star rating on this debut. As a parting side note, the band would like to downplay their youth (they range in age from 16-18), but it's simply incredible that they possess such refined talent and are still in high school. These guys are good, and they're going to be around for a while.